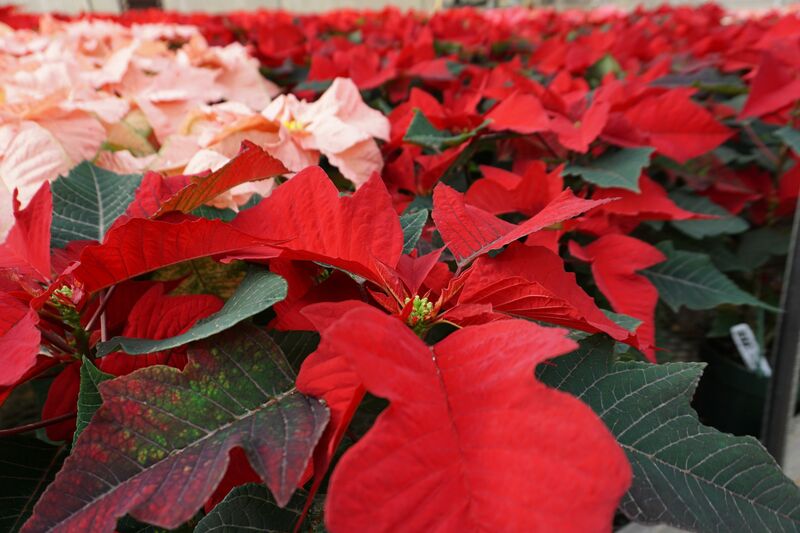 NEW CASTLE (Nov. 29, 2018) – The annual holiday sale of poinsettias grown at the greenhouse on the Department of Health and Social Services’ Herman Holloway Campus near New Castle will begin Dec. 3 and run through Dec. 20. The greenhouse is operated by Bright Spot Urban Farm and proceeds from the sale of the 1,800 poinsettias grown this season will help support young people aging out of foster care. Bright Spot Farms was founded by West End Neighborhood House in Wilmington. Available in red, white, pink and multiple specialty colors, the 6.5-inch pots are $9 each or $9.50 for specialty colors (Maroon, Ice Punch, Marble Star, Luv U Hot Pink, Sparkling Punch, Peppermint Ruffles, Ice Crystal, Cinnamon, Christmas Beauty Queen and Gold Rush). For orders of more than 25 plants, the price is $8 for each plant. The larger plants in the 10-inch pots come in red, white and a mix of red and white, and cost $30 each. The price includes a choice of the foil wrap on the pot (gold, red or green) and a plastic sleeve. Delivery is a flat fee of $7 in New Castle County, no matter the number of plants. In Kent County, delivery is $10. The Bright Spot Farms program includes up to nine months of training with an emphasis on soft skills such as punctuality, conflict resolution, a strong work ethic, and on business-related job and financial skills such as using a cash register and maintaining inventory. The program also teaches horticultural skills through a curriculum developed by program staff and approved by the Delaware Nursery & Landscape Association. As part of the program, youth have the opportunity to obtain a food handlers’ certificate issued by Delaware’s Department of Agriculture. The greenhouse is on the Herman Holloway Campus, 1901 N. DuPont Highway (U.S. 13) and is open to the public. Follow the signs for the greenhouse. The greenhouse will be open for walk-in sales Dec. 3-20. The hours are noon-5:30 p.m. Monday through Friday and 10 a.m.-2 p.m. on Saturdays. The greenhouse will be closed on Sundays. Bright Spot accepts cash, check or credit card. Orders can be made online using the order form at Bright Spot’s website or by emailing brighstpotventures@gmail.com. For more information, call 302-255-2993. See more photos on the DHSS Flickr site.